The tragedy that took place in Berlin tears apart a family: a mother who has made a horrible mistake, a father who cannot find a way out of his sorrow, and a daughter who misremembers. Theatre School graduate Aurelia is the same age as free Europe: she was born on the same day the Berlin Wall fell. Now Aurelia is on the threshold of her breakthrough: a cult director has cast her in the main role in his upcoming production. Meanwhile, Aurelia’s father is in the hospital, mute. Aurelia refuses to answer the repeated phone calls from her mother. What did her father reveal before his seizure? And who is this figure that seems to be walking constantly at Aurelia’s heel, transforming her reality and knowing everything that she doesn’t? In turn, Aurelia’s mother unravels the touching love story between her and Aurelia’s father, as well as the tragedy that befell the family over 20 years ago. Enjoyable reading packed with enigmas … It’s stories like this that make us look forward to Pulkkinen’s novels. Pulkkinen weaves a dense, suspenseful web of human fate […] A perceptive take on the magnitude to which the Finnish epidemic of silence can grow. Pulkkinen proves to be a master of depicting great emotions. Everyday matters are daringly exalted, spurred on by dramatic force. Aurelia’s father calls this tendency ‘aiming for the highest note’ […] Pulkkinen bravely rejects irony, aiming unashamedly for ‘the highest note’. Good for her. The novel is a living picture of the time, well thought out and sufficiently spacious…[It] is built of living fiction, truth and mystery. The narration is completely natural, the language, perfected, the characterizations, precise. The sexuality is uninhibitedly straightforward, lustily licentious and beautiful. This rich, full-bodied novel captivates. It pulses with energetic movement. In terms of style, Pulkkinen’s fifth novel is breathtaking, verbose and bombastic. The most affecting thing about it, though, is how the years distance people from one another... [The novel] definitely makes for memorable reading. It’s also a comforting book. The mother’s narrative parts are striking in their minimalism and straightforwardness while building up a picture of her painful emotions and experiences... There is also room for a doppelgänger theme at the core of the book, which Pulkkinen handles skilfully and abundantly. An elegantly carved tragedy… thanks to Pulkkinen’s dramatic strength and empathy, The Best of All Possible Worlds reads as a psychological thriller… All her images, thoughts and sentences are both beautiful and powerful. An intriguing, intelligent and brimming novel by this successful Finnish author is worth paying attention to. 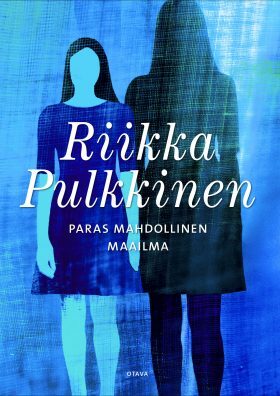 Riikka Pulkkinen plays effortlessly with many registers… Her strength is, above all, her eye for poetry in the daily life and her courage to dig deep into the psychology of her characters, so that the solutions eventually lead the reader to find a kind of new truth. The novel is filled with intelligence and colossal energy that Pulkkinen has harnessed to search for the concept of life and death.